I haven’t re-read this book as many times as the others. Next to Chamber of Secrets, it’s my least-favourite book of the series. Which is not to say it doesn’t have its moments — it does, some spectacular ones, and I actually like it a lot better when read in conjunction with Deathly Hallows. As a prelude to Book 7, it does a decent job. As a book on its own, though, I have trouble enjoying it — not least because I feel it’s a step back from Order of the Phoenix in a lot of ways. I’m not sure if this was maybe intentional — a sort of “calm before the storm” — but it feels odd. To have all the intensity of OotP, the ramp-up, the revelations… and then, in HBP, we lose so much momentum. For example, it will never not bother me that the DA stops having meetings. What sense does that make? Just because Umbridge is gone? There is now actually a war on, and yet Harry stops dispensing his wisdom to the people who looked to him for support and guidance. I think the DA was also incredibly useful as a method of inter-House bonding, for forming networks and relationships. My heart breaks for Luna, when she obliquely calls Harry out on his dropped interest: “It was like having friends,” indeed. And then there’s the amount of time this book spends on the fluctuations of teenage hormones. With a war on, with people disappearing and dying, with the near-deaths at Hogwarts itself… and yet our main characters spend far more of their energy on snogging, or arguing about snogging. Now, I realise this is entirely realistic. I remember being sixteen, and so I know that sixteen-year-olds do not always have the most appropriate priorities. But, to me, it doesn’t make for entertaining literature. It is nice that we get to see more of Hogwarts-as-Hogwarts in this book. In a lot of ways, this is the least disrupted year since Harry’s first — what with the Chamber of Secrets, patrolling Dementors, the Triwizard Tournament, and then Umbridge’s reign. I always wanted to see more of just what goes on in the classrooms (and am hoping for some more of that on Pottermore), and Half-Blood Prince delivers. (Except, oddly, in Defence Against the Dark Arts, of which we see comparatively little, considering that Snape’s in charge of it now). We also get to see more Quidditch, which makes me happy. I know JK got tired of writing it, but Quidditch is about the one sport I would actually follow, so I enjoyed it. I also remember this book throwing me for a loop right from the start, the first time I read it. In the previous five books, anytime we got information that wasn’t from Harry’s point of view, it was still because he was “seeing” it somehow — through a dream, or a vision, or the Pensieve. 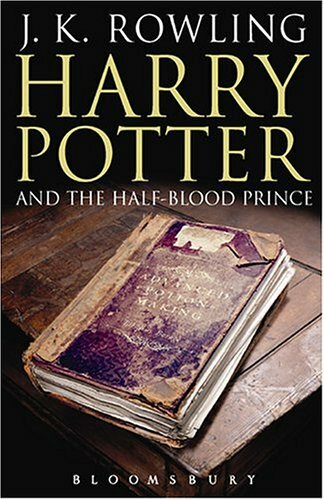 Half-Blood Prince opens with not one, but two chapters detailing events that Harry knows nothing about. And I’ve never been quite sure how to feel about that. On the one hand, it’s great information to have. (Spinner’s End, incidentally, is one of my favourite chapters in the entire series, largely because a friend and I had that exact conversation between Bellatrix and Snape while RPing, long before this book was ever released. It was nice to feel so thoroughly validated in our views on the characters). But on the other hand, it’s a jarring derivation in style, this far through the series. It changes the narrative rules. One development I do think is interesting is that Harry spends this entire book being 100% correct about Draco Malfoy, and yet… no one listens to him. Everyone, including his friends, dismisses it as a product of their long rivalry. (There’s also an interesting parallel there, with Bellatrix and Snape at the beginning of the book — Bella is, of course, 100% correct about Snape, and she damn well knows it, even if she doesn’t know why and can’t prove it). It’s frustrating to read, and I can understand Harry’s lack of patience with the whole mess — Dumbledore spends half his time treating Harry like a grown man who not only deserves but needs to know crucial information, and the other half still telling him to blindly trust and not to question. So, overall, this is not among my favourites of the HP series — but, as I said with Chamber of Secrets, even one that’s weak in comparison to the others is still a sight better than a lot of books out there. It improved on re-read, and it improves read in conjunction with Deathly Hallows.